What I Did On My International Break, By Lukas Podolski. Isn't it just classic Arsenal to follow a solid home victory against the antithesis of football with an unnecessary round of international fixtures that create injury problems in the squad? All that aside, it's time to focus again. Three points are up for grabs against mid-table Sunderland in a stadium where Arsenal have had their struggles in the recent past (one win from five.) Many of those non-wins came courtesy of Darren Bent goals, which are no longer a concern, but Sunderland still poses a variety of threats up front, including Steven Fletcher, Stephane Sessegnon and Danny Graham, just signed from Swansea. Every point is precious when you're chasing the leaders. It was at this stage of last season in the league where Arsenal started to come on strong. Every point dropped in February is another point you need to salvage later in the season. This is a pivotal month for the Gunners. This has to be a win. Bonkers, isn't it? Let's start with what we know: Kieran Gibbs still has another two or three weeks out, at best. It appears that Nacho Monreal will retain his place at left back, at least until Arsenal plays Bayern and Nacho finds himself cup tied. As for center back, there are two doubts, and that's the scary part. Thomas Vermaelen could be in line for a return from an ankle problem (he did not play for Belgium midweek.) If he doesn't and it turns out that Laurent Koscielny's calf injury is as serious as feared, it could very well be Squillaci Time! Dear God, hold me. Meanwhile, Aaron Ramsey skipped Welsh duty with a calf problem, so he's a doubt. Theo Walcott picked up a knock as England apparently won the World Cup by beating Brazil in a game that didn't count. Francis Coquelin was going to be close to a return from his hamstring injury around now anyway. The same goes for Lukasz Fabianski and his ankle injury, but he shouldn't be seeing any first team action any time soon. Predicted XI: Szczesny, Sagna, Mertesacker, One of those orange traffic cones, Monreal, Arteta, Wilshere, Cazorla, Podolski, Walcott, Giroud. There's very little to glean from the squad news available for Sunderland. Wes Brown is out indefinitely (likely the rest of this season) with a knee injury he suffered in October. As for the doubts, Lee Cattermole could be returning from a knee injury of his own, possibly injured while wrecking up cars, I don't know. Carlos Cuellar has been out since picking up a hamstring injury against Bolton Wanderers on January 5; he was withdrawn from that match in the 57th minute. Danny Rose, on loan from Tottenham and still famous there for scoring a ridiculous goal against Manuel Almunia, returned from injury by coming off the bench at halftime last week. Danny Graham failed to score on his debut for Sunderland. Well, after last week's ridiculous Jekyll & Hyde analogy, it was good to see that Mr. Horrible Defense didn't show his ugly face at the Emirates in Arsenal's 1-0 win over Stoke. Then again, since Stoke didn't really have the ball much during the match and never truly threatened, it's hard to know what to make of that. Perhaps most importantly, it's the psychological edge of finally keeping a clean sheet (Arsenal's first since the Swansea replay and second since Wigan away in December) that matters most. Speaking of Wigan away in December, that was the last time Arsenal beat a top flight side away from home (their other road win since was in the FA Cup against Brighton & Hove Albion.) Their other road results since include a draw at Southampton, a draw at Swansea, and a loss at Chelsea. Given that Sunderland starts with S, it would appear form is calling for a draw... After this match, Arsenal will play three straight at home before either a replay with Blackburn should that be necessary or the North London derby on March 3. As for Sunderland, they have won twice since scalping Manchester City 1-0 on Boxing Day. After that, the Black Cats lost to both Spurs and Liverpool. They drew Bolton in the FA Cup, then lost the replay at home. They managed wins against West Ham and Wigan, then a drew against Swansea, so things were looking up. 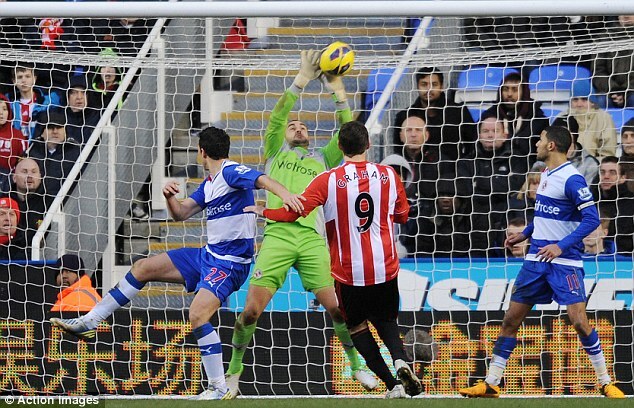 Last week, however, they fell to Reading, 2-1, after giving up an 85th minute winner to Jimmy Kebe. The loss dropped Sunderland to 12th in the table. They are eight points clear of the relegation zone. last season. I forgot how much those kits looked like pajamas. Arsenal won this fixture last year, 2-1, at around the same weekend in February, though it did not come easily. The match was 0-0 until the 70th minute, when Per Mertesacker injured his ankle on the poor quality Stadium of Light pitch. His crumpling to the turf meant that James McClean swooped in and scored easily, putting the Black Cats up 1-0. The big German was replaced by Aaron Ramsey and the Welshman equalized just three minutes after coming onto the pitch. In injury time, an Andrei Arshavin cross found Thierry Henry, who scored the match winner, and added another legendary goal to his tally in the process. A week later, Arsenal lost at the Stadium of Light in the FA Cup, 2-0. Sebastien Squillaci had to come on in the tenth minute, replacing the injured Francis Coquelin. Kieran Richardson scored first just before halftime. Squillaci was then subbed off himself in the 53rd minute, but Sunderland put the game out of reach after a bizarre play which led to an Alex Oxlade-Chamberlain own goal. Sunderland then lost to Everton in the next round of the cup. That's not an expression of much confidence, is it? The referee is Manchester-based Anthony Taylor. I'm not really sure how a referee based in Manchester is allowed to work a match involving either of the Manchester sides, but Taylor was actually excellent in City's draw with Liverpool last weekend, from what I could gather. Arsenal have seen Taylor twice this season and won on both occasions: 1-0 over QPR at the Emirates (in which Stephane Mbia was sent off) and 5-2 over Reading at the Madejski (in which Santi Cazorla had a hat trick.) Then again, over the course of three matches over previous seasons, Taylor denied to call two potential Arsenal penalties, so who knows? Taylor has taken charge of just one Sunderland match this season and it was three weeks ago, as Sunderland won 3-2 at Wigan.